The Bodhrán is a traditional Irish frame drum. It is closed on one side with a goat skin membrane and open on the other to allow the musician’s hand to be placed against the inside of the drum head. The drum is played with a stick, sometimes called a tipper. By hitting the drum head at different points and adjusting the position of the hand on the inside of the drum the musician is able to create a variety of tones and timbres. The Cajón is a box drum that originated in Peru, it is used in many styles of music and has become popular among Irish folk musicians. The instrument is most often played with the hands hitting against the front of the drum which is constructed from a thin sheet of plywood that acts as the drum head. The cajón in this sample library is a modern instrument and includes drum snare wires stretched across the striking surface to create a buzzing tone. 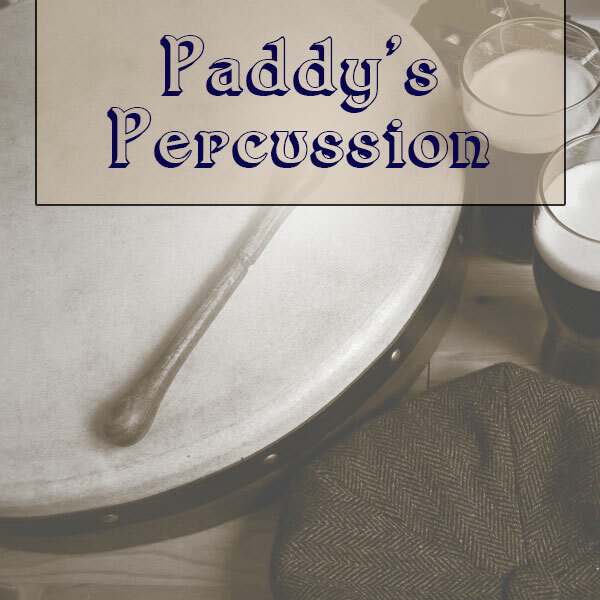 Paddy’s Irish Percussion was recorded in the same studio as Dicky Deegan’s Uilleann Pipes and Michaela’s Celtic Harp. Don’t like reading? Check out the official Paddy’s Percussion walkthrough video. The two instruments in this library share a common interface. The images in the following section depict the Bodhrán but the information presented is also applicable to the Cajón. Both instruments were recorded with four different microphones, all in close positions. Channel 1 is a bass drum microphone – placed behind the sound hole on the Cajon. Channel 2 is a cardioid AKG c214. Channel 3 is a Shure SM57 dynamic microphone. Channel 4 is an omnidirectional AKG c214. The microphone mixer allows you to adjust the volume (V) and pan (P) of each channel individually. The purge buttons can be used to unload the samples for a channel you’re not using. The rhythm slider is used to set the playback speed (50%-200%) of the pre-recorded rhythms. Kontakt’s time machine 2 mode is used by this feature to provide accurate time stretching. At it’s default position (100%) the rhythms play back at the speed they were recorded. The rhythms are looped and will play for as long as the key that triggers them is held. The loops were recorded free time, without a click, the tempos vary just like a live performance and there is no tempo sync/lock feature. 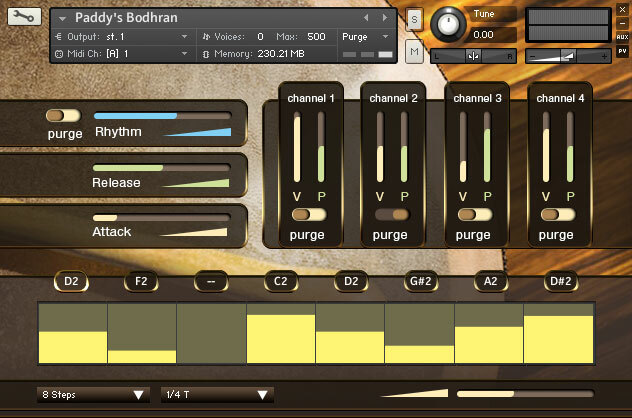 The purge button can be used to unload all of the pre-recorded rhythm samples across all microphone channels. These two sliders are used to adjust the release and attack times of the instrument. The interface provides a built in step sequencer for creating your own playable rhythms that can be triggered using a single key (see Keyboard Layout section below). The sequencer table (shown above) is used to set the velocity of each step in the sequence. You can change the number of steps using the menu below the table. A sequence can have between 2 and 16 steps. The musical length of each step can be set using the length menu below the sequencer table. The slider on the right is used to adjust the duration of each step in the range of 1% – 200%, the slider defaults to 100%. The buttons above the sequencer table display which playable note is assigned to each step in your pattern. To assign a note to a step first click on the step button to enter sequence edit mode, then press the key for the one shot sample you’d like to assign. Kontakt will assign the note to that step and move to the next step button automatically so you can continue to enter your sequence. Once you’ve finished entering your sequence click on whichever step button is highlighted to come out sequence edit mode. To clear a step completely hold ctrl on your computer keyboard and click the step button you would like to clear. The red keys are used to change between the sequences you’ve setup in the built in step sequencer. Holding down one of these keys will play the sequence assigned to it. The sequence will loop continuously until the key is released. The blue keys trigger the one shot hit samples. Holding a green key triggers the pre-recorded pattern mapped to that key. You can control the volume of both instruments using a MIDI controller assigned to CC11. The instruments also respond to the pitch bend wheel – this is especially useful for the Bodhrán to simulate the action of the musician’s hand against the drum head adjusting the tone of the drum in real time. Both the Bodhrán and Cajón were recorded with up to six dynamic layers which crossfade into each other providing smooth transitions as the MIDI velocity changes.